Biting Matters A great book about behavior! * Punishment rarely works. It is hard to deliver in a timely manner and only destroys trust. Trust is the most important commodity to have with your companion bird. * Never use aggressive behavior. Most birds will respond with aggression (like biting) in defense. This is natural. * ALWAYS ignore the behaviors that do not work in your home. If you or any member of your family responds at ANY time, this behavior is likely to continue. * Try to replace undesirable behaviors with desirable ones. 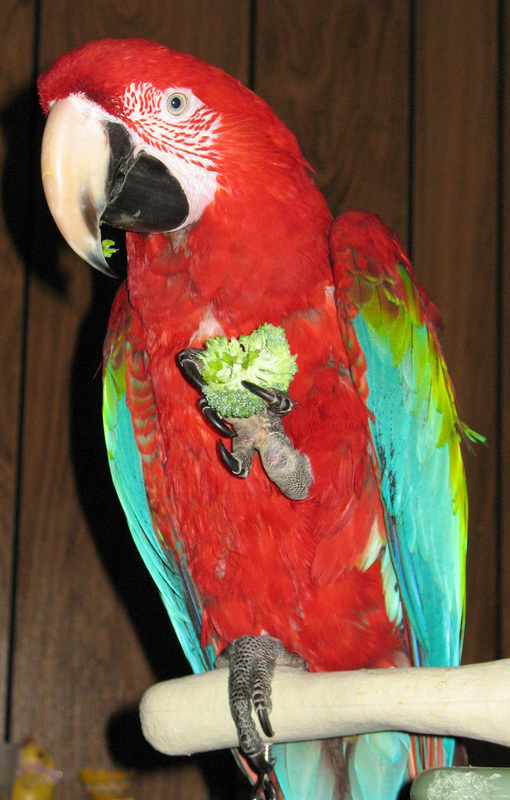 For example: give your bird a healthy appetizer (like a stalk of broccoli or a nut stuffed in a straw) while you are making dinner so they won’t be tempted to scream; give a treat for going into the cage so they will associate this with a positive experience; and say “Good!” or give a small treat when your bird steps onto your hand. * Discover trick training like: turning around, pulling up the bucket, or waving. This is a healthy way to maintain a positive relationship with your companion that does not include over-petting. Birds are really intelligent and they will appreciate your efforts to acknowledge this. * Respect your bird’s personal space. Ask them to step-up but give them room to come to you, try not to use force. Learn to read your bird's body language and give them the opportunity to make decisions and have choices. * Respect your bird’s house (cage). Many birds are territorial, nature has equipped them with strong survival skills in the wild. These instincts are still at work in our homes. It is not essential to pick your bird up from inside the cage if they are protective of it. Let them exit the cage and then engage in interaction. Service the cage when they are away from it. 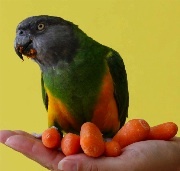 * Learn more about how your bird’s species lives in the wild, this may explain certain behaviors in your home. Is your bird a ground feeder or a canopy feeder? Does this species fly in large flocks or small groups? Does it mingle with other species or is this a single-species bird? 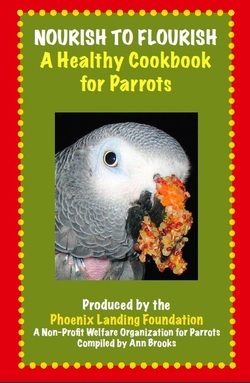 Join the World Parrot Trust (www.parrots.org), support parrot conservation programs. * Birds are prey animals which means they naturally seek safe places, and being high can also help them feel safe. We do not need to dominate our birds, so allow them to seek higher ground for comfort. Train them to come to you upon request by using positive reinforcement and rewards. 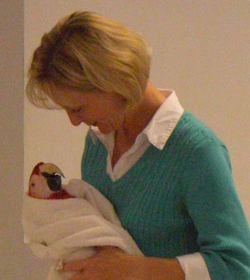 Recommended resources: Biting Matters and Project Parrot by Jenny Drummey; Birds Beyond Words by Leigh Ann Hartsfield; resources at behaviorworks.org including the helpful toolkit here; Clicker Training by Melinda Johnson; DVDs and books by Barbara Heidenreich; and Phoenix Landing seminars. Click here for the books. We REALLY recommend the 64w x 32d or 80w x 40d cages for the larger birds!! Make sure the bar spacing is appropriate for the species. Place the cage in an area that feels safe for a bird, like a corner or alongside a wall; away from heavy traffic and vents. 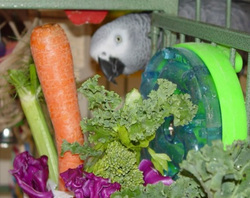 In addition to a parrot’s delightful house, they share their home with a flock - and that means your family. 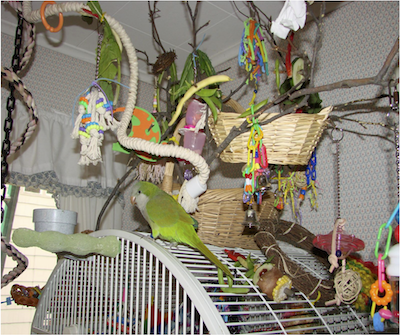 Make sure your bird has ample time out of the cage, so they have fun places to go. Perhaps a playstand for dinner; or an atom or boing hanging from the ceiling to encourage exercise. A safe outdoor cage is also a great idea, make sure it includes a partially covered top and things to hide behind to minimize fear if they see predators like hawks. Also ensure they can get out of the hot sun and have plenty of fresh water. Many birds savor the opportunity to take a shower in the rain. * Find a good AVIAN vet. 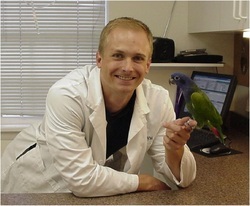 Dog and cat vets are not adequately trained to treat birds. Check www.aav.org for a vet near you. Since birds are prey animals, they do not show sickness until they are very ill. Try to visit the vet every year for a routine visit, and lab work regularly as well. * Invest in a small, gram scale and weigh your bird weekly at the same time of day. A 5-10% or gradual drop in weight could signify a problem. * Keep emergency supplies on-hand, a travel carrier ready for emergencies, and make sure bird-sitters know how to call your vet. Keeping a pillowcase under a chair cushion can make a great emergency carrier if the situation is urgent. 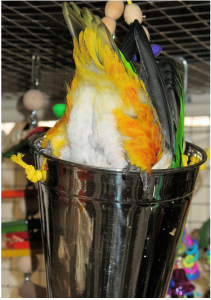 * Feather health involves access to regular bathing or showers, a quality diet comprised of a wide variety of wholesome foods, and lots of activities to keep that brilliant bird brain challenged and the body busy. * Make sure your bird has access to 10-12 hours of sleep in a quiet area away from the TV and other family activities. * Be aware of dangers such as ceiling fans; open doors; Teflon pans; chemical sprays, cleaning agents and perfumes; dangerous plants; and other pets. * Avoid toxic foods such as chocolate, caffeine, sugar, greasy foods, avocado, liquor and all junk food in general. * Learn to read your bird’s droppings to help track potential health problems. Avoid using bedding materials like corncob in the cage, these can be serious sources of bacteria.